Marine Blue by CapitaLand. New FREEHOLD Condo Launch in Katong. Marine Blue is a freehold development located at 95 Marine Parade Road, Singapore 449271, in District 15, minutes ride to Eunos MRT Station. Completed in Mid 2018, it comprises 124 units. Marine Blue is close to East Coast Park and Geylang Serai Malay Village. Facilities at Marine Blue include swimming pool, 24 hours security, BBQ pits, function room, clubhouse and playground. Numerous feeder bus services are available near Marine Blue. Several good schools are in the vicinity, including Tanjong Katong Secondary School, Chung Cheng High School, and Haig Girls’ School. Marine Blue is also within walking distance to the stretch of restaurants located at East Coast Road and Marine Parade Road. Residents can head down to the nearby Parkway Parade shopping malls for a host of amenities, such as supermarkets, restaurants and eating establishments, banks, boutique shops, and more. In addition, the Parkland Golf Driving Range is just a short drive away. 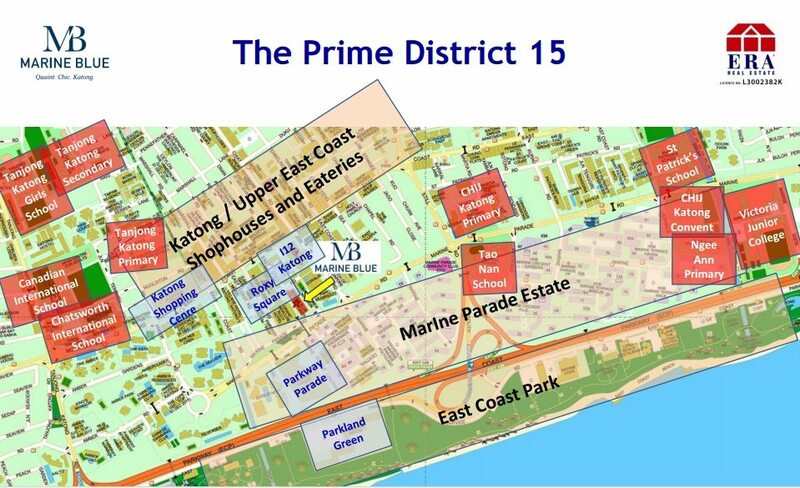 For vehicle owners, driving from Marine Blue to either the business hub or the vibrant Orchard Road shopping district takes about 15 minutes, via East Coast Parkway.